FIRST Robotics is a program for high-schoolers that teaches invention, design, and teamwork through the process of designing and building a robot to accomplish several tasks during competition. Although most of the teams are in the US, teams in over 25 countries worldwide take part in the program. Each year the competition has a different theme, and the tasks change. For example, in past years, robots had to be designed to shoot basketballs, throw frisbees, and climb a tower. The competition is announced in early January and teams have approximately six weeks to design, build, and troubleshoot their robots before competition. My sons participated in their high school’s team and count their robotics experience as one of the best parts of high school, and their teammates as among their closest friends. I think this year’s competition looks to be the most interesting and entertaining to watch in years (and that’s topping last year’s Storming the Castle theme!). And it’s a great introduction to steampunk for all the students taking part in FIRST. A steampunk outfit is really made by its accessories. They at once evoke the Victorian era that typifies the time frame of much of Steampunk culture, as well as adding bits of interest to your outfit. And no matter what manner of steampunk outfit you wear, you can always think up a reason why your character has been awarded a medal. Almost a decade ago now, my block decided to go all out for Halloween and to decorate to the max for the Trick or Treaters. And it has worked–we typically get 400-500 kids come by. It was also the beginning of my now yearly October making spree. The first year, we decorated as mad scientists–not a big stretch since my wife and I are both chemists, and let’s just say I had a lot of labware hanging around. A large glass beaker of rats spinning around, a jello brain, and some black lights to make the flasks of potions glow were all it took. Oh, and I was dressed up in lab coat and crazy mad scientist hair. Yikes! Halloween is less than three weeks away and I haven’t even started on my steampunk costume yet. If this is you, fear not. It’s not impossible to make a passable steampunk pistol prop in only a couple of days. A few years ago, my son wanted to dress steampunk for Maker Faire. We put together a reasonable outfit (He already owned goggles…), but he wanted a pistol to top it off, and Maker Faire was only a few days away. 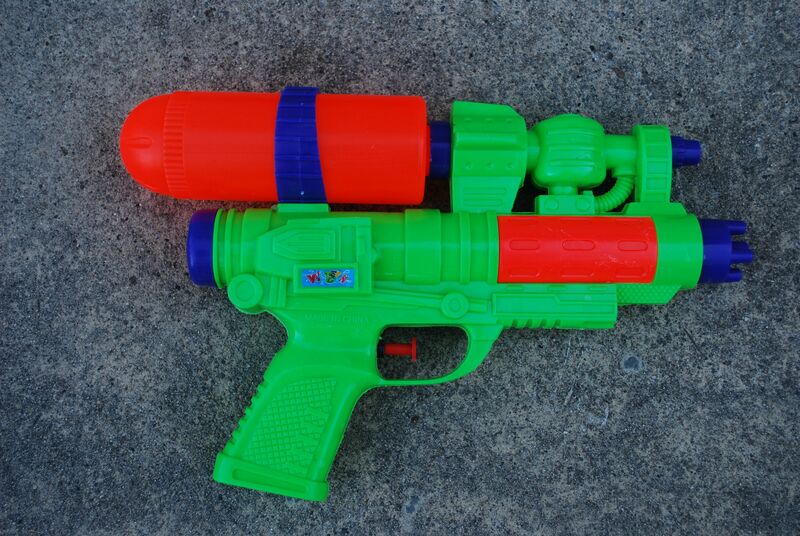 Fortunately, I had found this water pistol recently at a dollar store. Steampunk culture is very closely aligned to the Maker and DIY Movements. Because let’s face it: we’re recreating a past that never existed. We have to make our own artifacts. More importantly, steampunks love to talk about their creations and I’ve found them almost universally very generous in giving advise and help to newcomers trying to make their own steampunk gear.